No two of the circles intersect. Centers of all the circles in the family are collinear. All the circles are orthogonal to the common line of centers. None of the circles has its center between A and B. The family of circles contains one straight line: the perpendicular bisector of AB. A family of circles that satisfy #2 and #6 is said to form a pencil of circles. 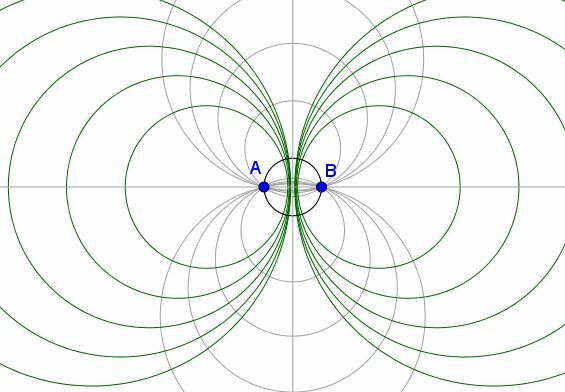 The circles are said to be coaxal (sometimes coaxial), because all of them have the same axis of symmetry and any pair has the same radical axis. This property is obviously shared by a family of circles through a given point, say, A and tangent at A to each other. Perhaps, even more interestingly, the same holds for the family of circles that pass through two given points, A and B: their centers lie on the perpendicular bisector of AB; in addition, the radical axis of any pair passes through their common points: A and B. Since any pairs of circles that have the same radical axis are bound to have their centers collinear, sharing the radical axis by any pair of circles in the family is the defining property of the circles. A family of circles is coaxal if, taken two by two, they share the same radical axis. Families that share exactly one point. Families that share exactly two points. The Coaxal Circles Theorem asserts that the families come out in pairs: all circles in one family are orthogonal to all the circles in the other. The pairing is simple. The Apollonian circles defined by two points are orthogonal to any circle through these two points, and vice versa. The circles tangent at a point are orthogonal to all the circles in the second family of circles tangent at the same point, but for which the radical axis of the former serves as the axis of symmetry, and vice versa. The second part is obvious as of the two perpendicular lines (axes of both families), one is tangent to all the circles in one family, the other is tangent to all the circles in the other family. The Coaxal Circles Theorem yields an easy proof of the #6 property of the Apollonian circles. Pick a point on the perpendicular bisector of AB and consider circle C from the conjugate family centered at this point. C is orthogonal to any circle from the given Apollonian family. This in particular means that the radius-vector of any of the circles to the point common with C is orthogonal to the corresponding radius-vector of C to the same point. It follows that the latter is tangent to the circle at hand and that the square of its radius is exactly the power of its center with respect to any of the circles in the Apollonian family.